Waves breaking north of Point Dorset. I haven’t been tramping for over 2 months thanks to some logistics, and it feels like ages. I hoping to get away to the Ruahines next weekend, and that’ll be nice. Meanwhile however, I had reason to drop Stacey off at Seatoun near Wellington’s south coast and next to the harbour entrance, and I thought that I might go for a walk around there rather than heading straight home. It was really only a 2 hour walk, but I’ll label it here as a daywalk because it could consume a day for someone who wanted it to do so. 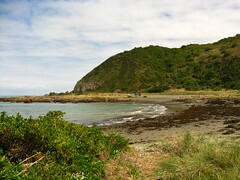 Seatoun is a Wellington suburb out past the airport. 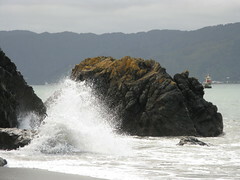 It lies on the eastern edge of the peninsula jutting into Wellington Harbour. 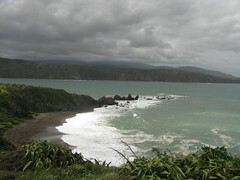 It’s very accessible to the coast, and there are a few walking tracks nearby which provide a really good experience of interaction with the sea both from beach-level and from the hills above, especially during a strong southerly where the wind comes directly over the sea from Antarctica and thrashes the coast. There was something of a southerly today but not a strong one and it was rather pleasant wind mixed with the sunshine and high cloud. My basic plan was to go for a wander around Point Dorset somehow, then come back along the coast to Tarakena Bay near the Wahine Memorial, and back to where I started (Seatoun) via what Wellington’s city council calls the Eastern Walkway. Route: Looping clockwise around Point Dorset starting from the Pass of Branda, then looping clockwise around the coast and up over the Eastern Walkway. I’d driven to Seatoun and parked the car near the “Pass of Branda”, which is the thin slit of a road that cuts through the hill from Seatoun to the southern coast. It’s easy to catch a Seatoun bus which runs 7 days a week, however, and it’s not far to walk from the end of the route. From the Pass of Branda it’s possible to follow tracks up either side (east or west). I started by climbing up the eastern track, which leads over the hills above Point Dorset, with the intention of walking along the hilltops, coming down to the beach, walking back around to where I started and then carrying on to the west. By itself, this is a nice dog-walking route or afternoon stroll for locals, and it can be completed in anything from about 20 to 90 minutes depending on various factors. The main track starts towards the east for about 500 metres, then veers north following the edge of the coast from high above. It’s mostly sheltered from a southerly behind trees and the top of the ridge, but along the way there are several short side-tracks that wander off to overlook the beach below, including one that looks directly over Point Dorset, just before the main track heads north before dropping down to the beach within another 500 metres. 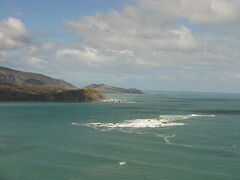 This whole area is the eastern-most point of the peninsula that juts into Wellington Harbour, bordering the narrow harbour entrance, and thus it’s about the closest that it’s possible to get to the far side without actually swimming or driving the entire way around — the opposing coast is about 1.5 kilometres away, but it’s about a 40 kilometre drive all the way around the harbour, with a further hour of walking to reach the lighthouses. Having been to Pencarrow Head on the far side quite recently, I think this was the first time I really actually looked at the Pencarrow lighthouses from here with some perspective. 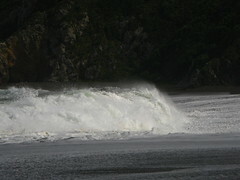 Waves coming into Breaker Bay. The beach on the inside of the eastern side of Point Dorset, inside the harbour, was fairly calm, but on turning the corner around the point to the beach of Breaker Bay, which faces south, the sea was notably far more active. With nobody else around, I stood there for quite some time just appreciating the sea. At the far end of the beach, about 5 people were having a go at some surfing. I don’t know a lot about surfing but I suspect the conditions were quite good. Back at the Pass of Branda after about 45 minutes of walking around a the Point Dorset loop, I kept walking along the coast, now heading almost directly south. The road joins the coast from the pass and there’s a cemented footpath along most of the inside of the road, but it’s still possible to walk along the rocky out-croppings on the sea-ward side. There’s also a lot of bird life, which I’m still learning to identify. I saw a pair of what I think were Variable Oystercatchers. One was completely black, and I understand you don’t get that with more common Pied Oystercatchers. There were also a few White-Faced Herons walking and flying around, and seagulls of course. Within about 30 minutes of leaving the Pass of Branda, I was at one of the Wahine Memorials, which commemorates the deaths of about 50 people when what was the equivalent of the Interisland Ferry struck Barrett Reef and foundered in the harbour entrance in 1968. As I mentioned in an earlier post, most of the casualties washed up on the Pencarrow side of the harbour, but many of the survivors came to this particular coastline between Palmer Head Point Dorset. 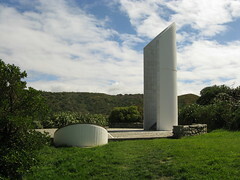 The memorial at Palmer Head consists of a plaque, and one of the Wahine’s manoeuvring propellers. Just past the memorial is Tarakena Bay, and it’s from here that a track begins to climb up the hillside to the ridges above the coastline along which I’d just walked. This walkway is officially referred to the “Eastern Walkway”, in the same way that the city council maintains a Northern Walkway and a Southern Walkway and a City-to-Sea walkway. Of all of them it’s easily the shortest as it’s only about 2 kilometres in length. Much of it isn’t clearly signposted as the Eastern Walkway, but it’s difficult to get lost if you simply follow whichever track-splits stay closer to the coast, and whichever signposts point to the Pass of Branda. Straight after climbing up the hill from Tarakena Bay, the walkway passes the Ataturk Memorial. The memorial commemorates troops who died during the Gallipoli campaign in 1915, and it was built as part of an agreement between the New Zealand, Australian and Turkish governments which also resulted in part of the Gallipoli Peninsula in Turkey being renamed as ANZAC cove. 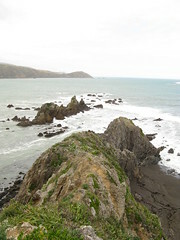 Apparently the site on Wellington’s south coast was partly chosen because of its resemblance to the steep and rocky terrain of the Gallipoli Peninsula that the ANZAC troops attempted to attack. The Eastern Walkway continues south above the coast, and I think the most striking view from here — at least with the conditions we had, was of Barrett Reef in the middle of the harbour. I don’t spend a lot of time walking in this area, and it was the first time the reef with its breaking waves in the middle of the harbour entrance had stood out quite so clearly. It really makes it obvious just how narrow the harbour entrance is. I spent some time simply watching a couple of ships come in, and manoeuvre their way between the reef and the Pencarrow coast. A little over an hour after I’d left the Pass of Branda for the second time, I was back there again, and that concluded a nice short walk. This entry was posted in daywalk and tagged daywalk, independent trip, wellington. Bookmark the permalink.